Speak Schmeak: Are you substituting learning for action? Are you substituting learning for action? I was on a social media teleseminar recently, delivered by George Kao, and he asked a profound question: "Are you substituting learning for action?" "Contemplation often makes life miserable. We should act more and think less. Take action and you can achieve ANYTHING." And in 2010, I really did consciously make the effort to act more and think less. But then I got lazy again, like many of us do. Does this concept resonate with you? Are you -- like me -- someone who is constantly taking classes and webinars, subscribing to a million newsletters for all the free tips, reading blogs, and packing your brain full of knowledge... but never putting it into action? Sometimes we don't value the learning that we get for free as much as we value the learning we pay for. This is just one reason we don't follow through with next steps. And sometimes we don't know how to take the next step, because the reading and watching is only one piece of the puzzle. 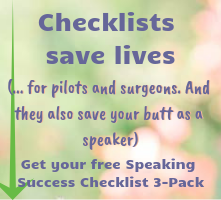 Public speaking training and education, like other kinds of training you might take, is only as useful as the action you take to implement it. I know a lot of you enjoy reading this blog, reading my newsletter, downloading my free handouts and watching my tips videos. And you're learning a lot, there's no doubt, because it's important to me that my content is valuable, even if it's free. But are you taking the next step? Are you acting on what you're learning? Are you standing in front of audiences and doing the things you've read about, like showing gratitude or using audience engagement techniques or grounding yourself? Because I don't want you to be wasting your time. Or your audience's time, for that matter. If you're reading and learning, but not doing, then what's the point? You're not growing as a speaker, and your audience is not fully engaged with you. I'm in the process of planning out 2013 for my business. I've got products and programs to launch, a mailing list to grow, speaking engagements to prepare for, and new opportunities (that I can't tell you about yet) to develop. I'm mapping it out, making a schedule, putting tasks and appointments on the calendar. I'm rethinking what I've done in the past and changing things up where necessary. Something I've been working on for a few months is reorganizing my programs and coaching. 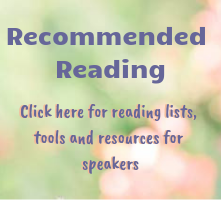 You can see on this page some of my new offerings, like my home study program, "Speak to Engage: 7-Step Shortcut to Public Speaking Success," and my new coaching formats, including my SpeakNOW Presentation Transformation Coaching Intensives. Something else I did this year was invest in my business. I joined a 9-month mentoring program that cost me a lot of money. The most money I've ever spent on my business, in fact. But it's worth it, because the guidance and support I'm receiving is helping me put into action ideas I've only imagined. I also signed up for a program to grow my skills in video. Because I want to stop talking about making videos and resenting the preparation involved, and just DO them. What are you doing to plan out your speaking growth for next year? Do you want to build your business through speaking? Do you want to get more visibility and credibility for your work? Do you want to be seen as an authority? Do you want to stop avoiding speaking and start enjoying it? Now let me ask you this: Do you have speaking engagements on your calendar? Are you investing in your speaking growth and planning for how to implement what you're learning? If not, why not? Don't wait for opportunities to come to you. Make them. Stop substituting learning for action. Start doing. 2013 is going to be a big year. Can you feel it? What are your plans for growing as a speaker next year? Share in the comments!